Camping is a fantastic family activity that allows you to make lifelong memories and expand a child’s education well beyond the classroom. Family road trips and camping excursions provide loads of opportunities to show them natural and manmade attractions across the country and teach them about the natural world. It also requires taking the necessary precautions to keep the trip educational and fun while avoiding injuries and other mishaps. Follow these tips to make sure your children or grandchildren will enjoy a safer camping experience they will remember for a lifetime. Kids are going to want to get outside to play and explore as much as possible while on the road. Make sure they are protected from the sun with sunscreen, a hat and sunglasses. 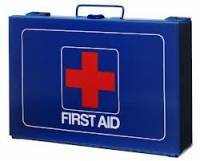 Always have a first aid kit on hand. Kids are prone to bumps, scrapes and bruises, so you should always have a good supply of adhesive bandages and basic supplies. There are plenty of options available that are designed for RV travel, or you can make your own kit by gathering basic first aid supplies and storing them in a tackle box or other compact container. Flip flops might be fine for the beach, but they are not a good choice when exploring wooded areas or making your way down slippery slopes to swim in the campground’s creek. Make sure your children or grandchildren have the proper footwear for the activities you anticipate partaking in during your journey. This usually means a good pair of tennis shoes for exploring the campground or sturdy hiking boots if you plan on seeing the sights on family hikes. You cannot save your kids from every mishap that may occur while camping, but you can take steps to prepare them for what they might encounter. Before sending them off on their own to play, make sure they can identify potential hazards, such as poison ivy and poison oak. If you plan to camp in an area with lots of wildlife, make sure they know what to do if they encounter an animal while out alone. Ticks, mosquitoes and other bugs your kids may encounter throughout the day can cause painful bites or carry diseases. Protect your kids from insect bites by applying insect repellent before sending them out to play. Many natural options are available, so you can protect your children from insect bites without exposing them to unnecessary chemicals.